Julian Kelly was born in Baltimore, Maryland in 1983 and was placed for adoption shortly thereafter. She has been searching for her birth-family officially since age 18, but had been searching on the internet since age 12. Her adoption has deeply affected every aspect of her life, which led to the formation of the documentary film “ Almost Family”. She is interested in educating the general public about the unintended consequences of adoption, and the links between adoption and mental illness. Julian has a long-standing history as an advocate for marriage equality, and is now advocating for adoptees’ access to their original birth certificates. 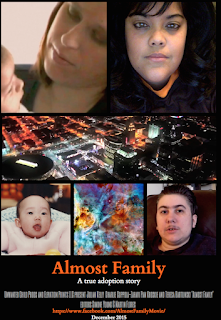 While filming the documentary “ Almost Family” Julian was able to find some of her birth family through DNA testing, but has not yet confirmed the identity of her birth-parents. Making the film was cathartic for her, but she emphasizes that adoption reunions are not for the faint of heart. Julian firmly believes that having basic and accurate ancestry information is a basic human right. Her documentary explores many facets of adoption that are often ignored by mainstream outlets. Tell us about your new project Almost Family? What inspired you to make this film? Julian: Almost Family was inspired by a mental breakdown- that’s the truth. I’m an adoptee, and after searching for my biological family for decades I was emotionally exhausted. My adoption agency seemed to be creating barriers to reunion and I became desperate to process the loss of my biological family, seek community, and actively continue working toward reunion in a new more healthy way. That’s how the film was born! So, this is your personal story? Why is it important for you to turn your own story into a film? Julian: This film is much bigger than me, or my life. Although my story is a huge part of the movie, what happened to me is representative of the narrative of many other adoptees who underwent closed adoptions. We face a lot of the same challenges. In closed adoptions virtually all of us are denied access to our original birth certificates. It is unbelievably difficult for us to try and find answers regarding our relinquishments when many of us don’t know our birth-parents’ names. What is the main message you want people to gain from this film? Julian: I want people to understand that adoption doesn’t always have a happy ending. Sometimes people are adopted by abusers. Sometimes birthmothers and adoptees find that they cannot overcome their grief. Adoption has lasting effects that go on for generations. For instance, my children (if I ever have any) may never know the identity of their grandparents. It is time that we create more humane alternatives to closed adoptions. Everyone deserves to know where they come from. Everyone deserves to know the names of their parents, their true birthday, and their ethnicity. Since making this film, have others come forward and shared their story with you? Julian: I feel so privileged by the reception I have received from other adoptees. Many adoptees have told me about their lives. Birthmothers have talked to me, and even adoptive parents have spoken with me about their own personal struggles with attachment, depression, and trauma. Storybook adoptions have been given a voice, and it’s time we make space for those adoptions, which caused harm. Is this the first film you worked on as a Director? What other projects have you been apart of? Julian: This is my first time directing a movie. I was raised in the performance industry, and I’m also an academic. I performed in the National tour of the musical “ Songs from the Soul”, “ Dreamgirls” at La Comedia, and many others. I starred in the feature film “ The Devil’s Courthouse” by Pindar Films, and appeared in the short film “ Syringe”. I also recorded a music album, which is appropriately titled “ The Family Reject”. 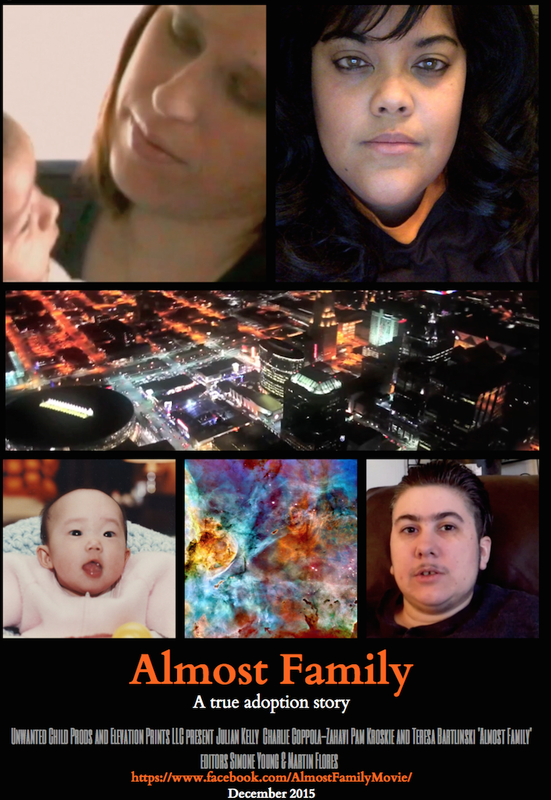 When does Almost Family get released and how can people watch this film? Julian: Our official trailer is available both on Youtube, and on the Facebook website. The movie should be available for download at the beginning of December 2015. Do you plan on working on other film projects? What is the future for Julian Kelly? I always ask myself the same question. I’m kind of a recluse. I like to work a little bit, and then disappear...and then reappear doing something totally outside my normal frame of reference. I believe life is about experimentation, so I’m always reinventing the way I view myself, and others. I don’t know what I’ll be doing in the future- but you can bet that it won’t be necessarily main-stream. I’m very invested in giving a voice to the little guy.